how can I link task to list item. 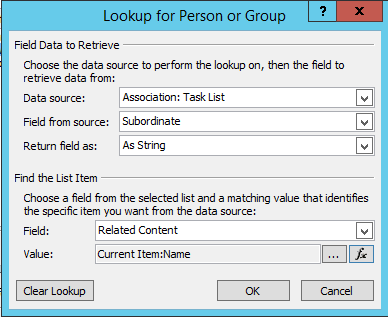 I need to link between the related content field from task list and Name (linked to document with edit menu) field from the list itself. I need to email the subordinate that is exist in task list. I did the below and I tried to print it in an email and it shows empty value. nothing is there, for that it is not sending any emails to the subordinate. This is because the work email or email address is not associated in the AD or User Profile Service with that value of "Subordinate". Please check with other Subordinate values. Not the answer you're looking for? Browse other questions tagged task-list list-item links or ask your own question. Display the Actual “Related Item” in a Task List using JSLINK?